A planned strike in a row over the role of guards on trains has been called off by the National Union of Rail, Maritime and Transport Workers (RMT). Members were due to walk out for 24 hours on July 21 in the latest of a series of strikes against the company over the past year. RMT General Secretary Mick Cash said: “RMT’s negotiating team has been in talks with Arriva Rail North over the past week in an attempt to seek a resolution to the long-running dispute. “Reports from RMT representatives and correspondence from the company have set out a process for reconvening talks around proposals to set up a joint working party to consider a range of options on the deployment of on-board staff, including a specific option of retaining a second safety critical person on board all ARN trains. 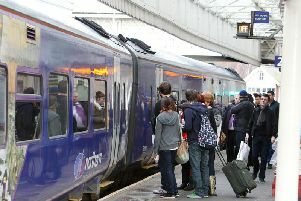 “RMT’s National Executive Committee has noted this situation and has stated that these talks must commence this week. Also, the union’s NEC has instructed our team to negotiate around the guarantee of a second person on every train and their safety critical responsibilities in the first instance. “Weekly updates will be given to the RMT NEC on how these talks are progressing.